The Daily Effort to Port Rowan that I model on my layout is a mixed train. Such trains are interesting for many reasons. They haul carload freight, but as a passenger train they also have a schedule to keep. That schedule can be quite relaxed – more of an ideal than reality – and one consequence of this is that running a mixed train on a model railway often feels similar to running a local freight, but with one or more passenger cars tacked on the end of the train where the caboose should be. Since operating sessions on my layout involve just one train at a time, I’m always on the lookout for ways to duplicate the activity of a real crew. I often run “two days”, back to back, in a single session – with a freight extra run one day and a mixed train run the other. I’m therefore also keen to find ways to differentiate between the two experiences. When I run M233 to Port Rowan, I want it to feel unique – not like Extra 80 West. One way to do this is to represent the express and merchandise carried by mixed trains, in baggage compartments or separate boxcars. In addition to a few full cars of freight, mixed trains carried less than carload lots – otherwise known as LCL. Railway LCL was the precursor to today’s logistics companies – think Fedex, UPS, DHL, TNT and so on. If you think about how such services are used today, it’s easy to see how LCL service made railways a vital link for the citizens in the communities they served. Back in the day, people in Southern Ontario might place an order the catalogue operation run by the T Eaton Company and have anything and everything from hardware to housewares delivered via rail to their local station for pick-up. Stores and other businesses would place orders with suppliers and their products would also arrive via rail – everything from cases of canned goods to stock the grocery store shelves, to a load of furniture for the local department store. The challenge is, how to model this in a meaningful way. Currently during operating sessions, station stops are made in both directions at St. Williams to allow for the exchange of passengers, express and merchandise. In addition, after M233 arrives in Port Rowan and is ready to begin its switching, one of the tasks is to spot the passenger equipment (baggage-mail car and combine) plus the boxcar working in LCL service in front of the station. This is to be done as early as possible so that unloading and reloading may take place while other, carload freight cars are being worked. But I suspect the importance of the work on the “passenger” side of the equation fades into the background as crews – myself included – focus on reading freight car waybills, drafting switch lists, and figuring out the moves needed to spot and lift cars. As I’ve already noted, that can make the mixed feel like a freight extra. I was able to scan a relatively clean receipt from the book, clean it up further, and create a blank form. I resized this to 4″ wide (by about 3″ tall) so I can put four of them on a single page for printing. Obviously, the receipts for Maynooth and area will be somewhat different than those for freight delivered on my line. But it’s easy enough to pick through the prototype paperwork and adapt it to my own needs. I start with the names. To add local flavour I can use names listed in Down By The Bay, a book about the history of Port Rowan. I can also acknowledge people who have helped me with prototype information or with building the layout by making them customers of the railway. In the upper right, a “C Abbott” in Port Rowan is receiving a shipment. C Abbott is of course my friend Chris Abbott. 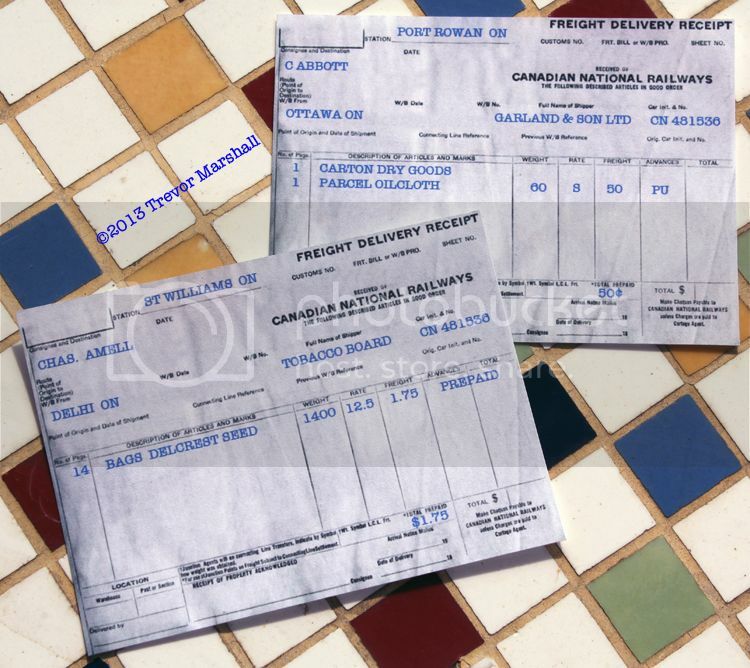 Chris’ shipment is coming from a real company – Garland & Son Ltd of Ottawa – which was listed on one of the prototype forms. That form also provided the description of the freight. In the lower left of the above photo is a shipment to St. Williams. Here, I used information from a shipment of seed to Maynooth to create a fictitious load – 14 bags of tobacco seed from the Tobacco Board in Delhi. The weight, rate, and other information came from a real form for a seed shipment. 1 – As with the waybills and empty car bills I use for car forwarding, these receipts will be part of the paperwork packet that the conductor handles. The conductor will leave receipts at stations (in the waybill boxes at St. Williams and Port Rowan) as goods are unloaded. 2 – I will make up some waybills to cover LCL shipments from St. Williams and Port Rowan to the rest of the world. I can do this by modifying appropriate shipments in the prototype book. 3 – I will develop a set of rules about how to use the number of items on a waybill, the weight, or a combination of both to determine how much time it takes to unload or load the LCL. For example, it might take 30 seconds for the crew to transfer a 100 lb bag of seed from boxcar to baggage wagon. So, maybe 30 seconds per 100 lbs of LCL is appropriate. The conductor will then calculate how much time must be spent at the station stop to perform the work. I have fast clocks, so this can be measured. 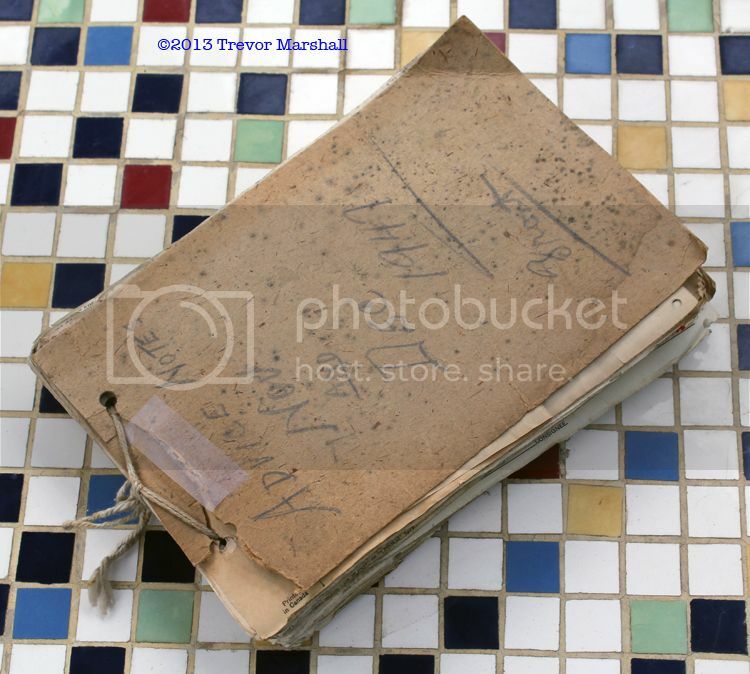 4 – I noticed several receipts marked “Fragile” – including at least one receipt for an organ and chair (at 300 lbs). Goods listed on receipts marked Fragile may take longer to transfer. 5 – Depending on where the LCL is located in the train, the conductor may order that cars be repositioned to assist with unloading or loading. For example, M233 may stop at St. Williams with the LCL boxcar lined up at the platform to unload, then pull forward to make it easier to unload the combine onto the same baggage wagon. That adds an extra move to the operation. 6 – Some of the prototype freight receipts are addressed to the section foreman, and cover articles such as spikes, paint, and tools and the like. These receipts are marked “OCS” (On Company Service) in “freight” or “advances” column. Since I have a section house in Port Rowan, I could require that the LCL boxcar be spotted in front of the section house if there are any OCS shipments to unload. This would be in addition to any LCL that must be unloaded / loaded at the station. I will continue to think on this, and develop my ideas through tests during operating sessions. 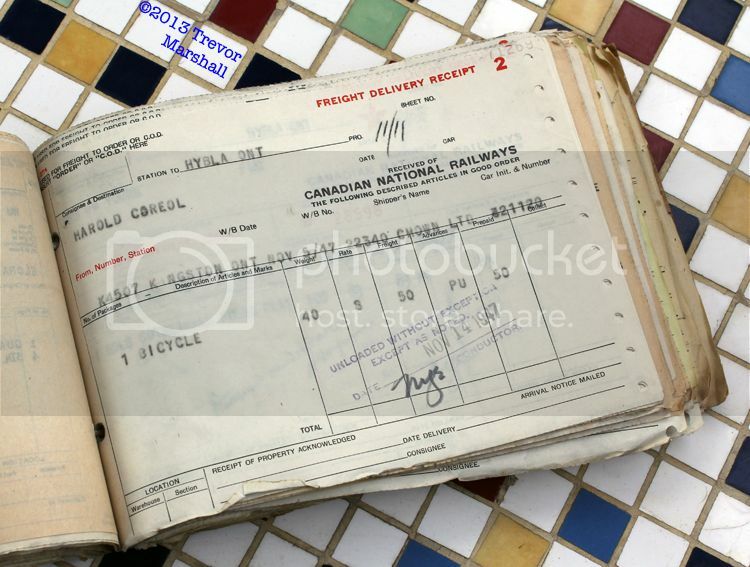 The important thing, for me, is that I have a record of the data so I can create freight receipts – and that looking at this very neat record of mid-20th Century life in a small section of eastern Ontario is giving me ideas to help enrich the operation of The Daily Effort to Port Rowan. Thanks, David, for the loan of this book. What a great find! UPDATE – July 13, 2013: I’ve just discovered the existence of the LCL_Ops_Modeling Yahoo Group. Membership is required to view the posts, so I can’t offer any more information about what one will find there, but I’ve applied for membership. If you’re interested in LCL operations, you might also want to give the group a look. UPDATE – July 23, 2013: A friend reminded me that Ian Wilson wrote a useful article on LCL operations on the CNR out of Palmerston, Ontario, which appeared in the July 1997 issue of Railroad Model Craftsman magazine. It’s definitely worth revisiting if you’re interested in representing this style of traffic on your layout. This entry was posted in LCL, operations, resources by Trevor. Bookmark the permalink. This is cutting edge thinking. I look forward to following along. Ian Wilson’s articles in CN Lines and RMC might help you out. “Palmerston–Lcl Hub for the Bruce” in CN LINES Volume 7 Number 2, or “Palmerston, lcl and the CNR” in the July 1997 issue of Railroad Model Craftsman. Thanks for the reminder. I’ll have to look them up. I can’t remember if they include informaiton about effectively modelling LCL operations, or whether they focus exclusively on the prototype. No matter, though – I’ll figure it out. It can’t be too hard to determine how long it would take a crew to transfer a 100 lb sack of seed, right? Great work, Trevor – I knew the book was in the right hands! This is definitely part of what railroads actually do. Very interesting find and a really realistic operating concept. I don’t think we realize how important the LCL traffic was both to the railroad and their patrons. You could make some judgement about the commercial importance of a community by whether it had a separate freight house to handle LCL or, more commonly in western Canada, how large the freight storage space was at the local depot. There is an article in the August 1993 issue of Trains Magazine about LCL. There is also an article in the October 2005 issue of Branchline about the St. Albans, VT freight house. Again, thanks for providing some very interesting information. Thanks for joining the conversation – and I agree: As modellers we could give more consideration to the role of LCL on the prototype and how to model it on our layouts. I’m enjoying working through this. Thanks for the references to Trains/Branchline. I’ll look for those articles. Very neat — definitely can be added to any RR of the LCL era. As a kid in 1962 we shipped LCL from Portland Oregon to Newark Delaware to lighten the load after camping vacation and family visit in the northwest. We were killing summer on cross country road trip as we moved from Austin Texas to Delaware when my dad left University of Texas to go to UofD. He had to teach summer school in Austin. I still have SP forms for origination and freight came in on B&O in Newark about a month later. Trevor amazing work indeed! I have been quietly following your blog for a couple months now, and I must say you are making a compelling layout!! I love the idea of modelling LCL ops for the mixed train… I personally have been planning an N scale modern day layout based around Waterford, ON but reading your posts I am more and more leaning towards modelling my hometown of Hanover ON in the 50’s and either S or O now! I really like how you capture the feel of working the branch to Port Rowan… very forward thinking! Keep up the amazing work Trevor! Thanks for the kind words, and welcome aboard! I’m pleased you’re enjoying my blog. Finding appropriate equipment in S or O would be a challenge, although easier if you are looking a first-generation diesel vs. steam. And HO would work really well for Hanover, since (again, working from memory) the spurs take off at odd angles from the mainline. Again, thanks for the kind words. Happy modelling! Yes for sure Hanover would take up a fair bit of space to model even a small portion… hard to put down into a linear plan! Ian Wilson’s Palmerston book covers it very well actually, a bit busier than the branch to Port Rowan, but still small time railroading, and I agree HO would be probably a better choice. The heft of S scale has intrigued me, from years of working with N, capturing the mass of the real thing, especially at a higher viewing angle, I can see it would be easier to model branch line operations compared to a more “mainline” biased layout. Keep up the great work! BTW The local historian for Hanover is an old teacher of mine, and if you would need any industry names etc from the Hanover and area, for waybills etc or the LCL traffic, I could always try to get some info for you! It sounds like you have a good handle on the project. Let me know whether you decide to switch from N.
As an FYI on LCL frieght, I remember going with my father to St. Williams station to meet the train as it stopped on its way to Pt. Rowan. He would be shipping a wooden case of eggs to Dominion Stores in Toronto. There were 30 dozen eggs in a case and it would be loaded in the forward part of the baggage car. Sometimes the engineer parked the mogul right on the road crossing upon arrival while the freight was loaded as this was a blind approach when coming from the South with many accidents or near misses especially in the summer with all the tourists who didn’t know the train schedule. Dad also received cardboard boxes of live baby chicks off the train in the Spring. He would order them through George Luckam , a large poultry farmer/dealer near St. Williams. We had to rush home to the chicken brood house to water these young chicks-100 chicks to a box. Some important freight indeed on the train! Great information, as always! I will definitely have to add some egg and chick shipments to my stack of LCL freight receipts – for shipment in the baggage car, of course. A always, Trevor, this is great stuff. I have always wondered how to model this operation in the way we operate trains. LCL and Express were important money makers for the railways. CN ran a baggage car well into the 70’s on the Haliburton Sub. that was loaded in Lindsay and then later in Peterborough. CN Lines Issue 58 (16/1) has a picture of the Westport Mixed being loaded in Brockville with Express shipments on the back cover. There are two carts and they are piled high with boxes of various sizes. The LCL I imagine is in one of the boxcars on the train already, up near the engine maybe, or possibly the boxcar nearest the combine? Anyways, glad you are exploring this aspect. Cheers. Since the LCL car is really running in a sort of passenger service, I suspect it was located adjacent to the passenger cars. 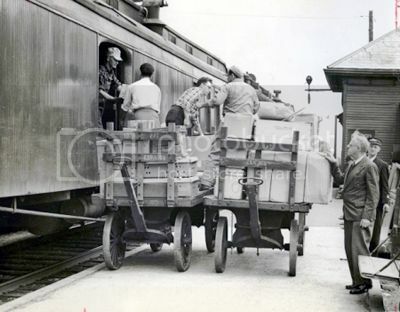 It would be unloaded / loaded at stations without being removed from the train, so it makes sense that it would be close to other passenger equipment that would need to be unloaded / loaded with a wagon too – such as the baggage compartment of a combine. I’m enjoying trying to come up with a system that’s workable for this. Finally! I’ve been waiting ages for that oilcloth! Glad I could help, Chris! Trevor, what find and a fascinating addition to ops. I’m modeling the 14th subdivision of the Milwaukee Road serving the Olympic Penninsula in Washington state. The 50 mile branch between Port Townsend and Port Angeles was fed by a 3 track barge operation at Port Townsend. Until the Hood Canal floating bridge was built in 1961, almost all good flowed into and out of the area via this obscure and isolated branch of the Milwaukee Road. Your inspiration of LCL freight deliveries will add an additional variety to our operations. Thanks for the kind words. BTW, I’m a big fan of the MILW – I have a number of books, including The Milwaukee Road by Frederick Hyde, which is on the short list for my all-time favourite rail fan/prototype tour book. Have fun with the layout! As I am doing a small narrow gauge short line in 1904, I would suspect for many of the small towns and villages that there would be as much less than a car load freight as there would be car load freight. After all only a few of the normal businesses would be able to send or receive a full box car of freight. Few of the others would even be located on line, so the freight house the station and the team track had to handle a very large part of the daily freight especially in the smaller towns and villages. Trackage such as sidings cost to lay and maintain and also add to the RR property taxes, so I assume you had to be need car loads before the railroad would go to the expense of laying a siding. Some that might be car loads in form of feed and hay for all those horses cattle and other farm critters. I am also wondering how to get rid all of the horse poop from my town streets, perhaps we can find some one to send it to, perhaps one of those fertilizer companies. Good points. I made the same observations about LCL when I was modelling a Maine two-footer in O scale. Studying the prototypes I realized very few customers had their own, private sidings. Most used freight houses or team tracks. The same is obviously the case with Port Rowan, where the team track is so vital to operations. I understand and it is the Maine two foot that I use as my ideal in a free lance version in HOn30. Once there were paved highways and dependable trucking then it began to disappear, even as automobiles and buses began to eat away at the passenger business in the 1920’s. I have four HO scale 1904 curved dash Oldsmobiles which hardly look like a threat to my railroad. I am planing a small Oldsmobile dealership in my main town, complete with 1904 Oldsmobile advertising posters. I model the OR&W, a 3′ gauge that existed in the southern ohio 1878 to 1931. My time frame is 1900-1910. Other than passenger…alls the OR&W hauled was LCL freight. The book “Hidden treasures” describes how the engineer would simply stop the train at stations/freight depots or flag stops and the folks expecting delivery or waiting to load thier freight would than do so while the train occupied either the main or a small sideing. Most of the time, the main. How do you generate that “RANDOM” traffic, to say it wasnt random i believe fails to study history, especially of these areas and this time frame. The Excell random switchlist programs outlined in the MRH forum/operations i think does this very well. best of luck with your endeavors trevor. Thanks for the kind words and welcome aboard. So far, my system is working – I’ll write more about it when I’ve had a chance to run more operating sessions with it. Hows the LCL freight forwarding, etc. coming along? I’m presently studying some Excel spreedsheet tutorials to better understand their use and how I might develope a system, flow if you will of LCL freight. Bearing in mind it has to be almost completely random with a few exceptions. The hay and feed loads could be scheduled regularly but only seasonally. Same with most ag products. Of course you could just run your ops with a random summer day in mind every time? Any generic local manufacturer without the capacity/demand to fill full car loads could be another regularly scheduled LCL as well, useing a team track or basic depot/freight house. Seeing that most local LCL on the OR&W didnt go to interchange or distant cities passed the end of the line so to say, a 4 turn waybill won’t work. Im thinking 3 turn waybills…. (to loading spot, to unloading spot, to yard) Multiple waybills per LCL car! A car could end up bounced around down the line for several sessions before going to yard, ultimately for reassignment. Your thoughts? Best to you and your RR. I have to admit that I haven’t done much more with this, beyond the initial filling out and printing of waybills for inbound LCL. I need to make up similar waybills for LCL that’s generated on the layout, headed for offline (staging) destinations. The waybills will look the same, but there will be fewer of them since outbound LCL traffic will be less random. A wide variety of “stuff” can be shipped to retail businesses and residents in St. Williams and Port Rowan – but outbound shipments will be primarily from local manufacturing businesses and farms in these two communities. I also need to make up some appropriately-sized storage spaces on the work tables at St. Williams and Port Rowan to hold inbound and outbound LCL waybills. They’ll get lost in the waybill boxes. I’ll post an update when I have one to post. Trevor, any progress on the LCL operations on the layout since your initial post? I’m glad you found my LCL Yahoo group, BTW……I know it’s not that active, but there is a lot of good info stashed away within it, and some VERY knowledgeable folks who are more than happy to share what they know. As you may or may not know, I did an article in the OpSIG Dispatcher’s Office a few years back on my particular operations for my layout, which are the opposite side of the LCL spectrum, being based in the big city on the beginning of an item’s journey, typically speaking. If you don’t have it in your colelction, I’ll be happy to pass it on, maybe it’ll help your own operations, if nothing else, to see things from the other “direction”. Looking forward to hearing what you’ve done soon! Actually, the long answer is, “some”. I’ll write a new post to update everyone since they may not be digging through the comments on older posts.